Join the First Friday Network and take advantage of our range of membership benefits to get the best out of networking and offers to really help you promote your business. Refer your friends and business associates and get commission! All you need to do is supply them with your unique referral code and if any new members subscribe with your code then we will pay you a commission. You could get your own membership fee or more back to cover the cost of your own First Friday Network subscription. Referral payments are generally made quarterly through the year. You will need to have an active membership plan to receive commission payments and the amount of commission you receive will be dependant on which plan you are subscribed to. We understand how hard it is as a small business owner to find the time to work ‘on’ the business as well as ‘in’ it. 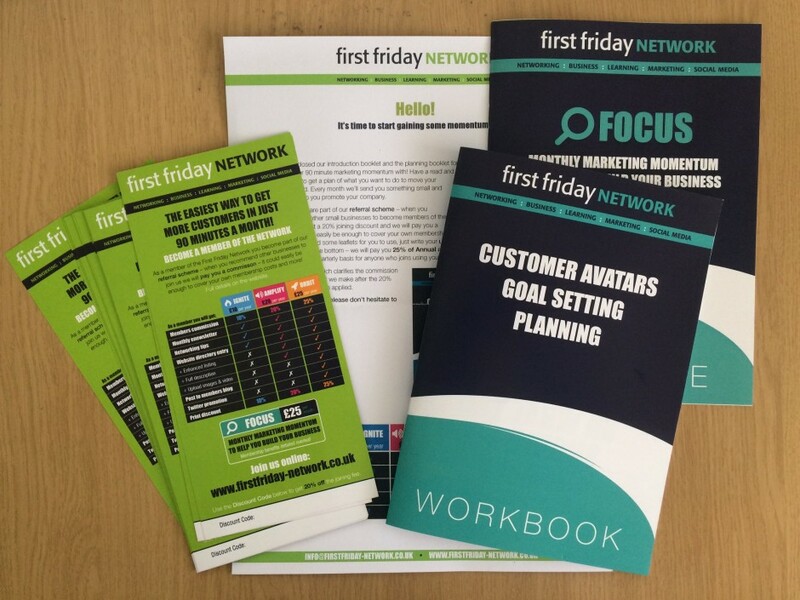 One of the big issues for most businesses when it comes to marketing and promoting themselves is having to start with a blank piece of paper – so we are doing the hard work for you, we’re giving you the starting point each month and guiding you through the process so that you can get results quickly. We’re asking you to find just 90 minutes a month and we’ll give you all the marketing momentum and motivation you’ll need. Our top tips to develop your networking skills and reap the rewards of networking. Take advantage of discounted print prices including business cards, leaflets and roller banners. Promote your business with an entry in our members directory. Say more about your business with an enhanced listing in our members directory. Explain your services clearly to potential clients with a full description. Upload image and embed video to give your listing a strong visual impact. Blog on the First Friday Network website with unlimited entries and option to include an image. Let us help promote your business on Twitter. Receive our welcome pack to get you up and running with networking.